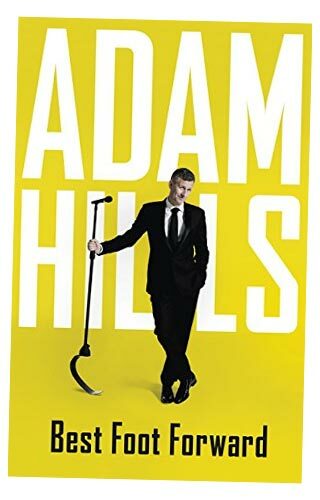 Adam Hills is surely the most positive man in comedy. So it would be delicious to report that had used his autobiography to settle old scores, start new feuds and indiscreetly call out all the bastards he’s encountered over his career. But, no. Best Foot Forward is as hospitable, heartwarming and uplifting as you could expect from the ever-affable Aussie. Unlike many comedians’ memoirs that revel in the innocence of childhood, Hills’s youth in the southern suburbs of Sydney are quickly dispatched, covered just enough to established that comedy was his first love from a very early age listening to Kenny Everett or Billy Connolly, much less cool than classmates who were into bands. He credits his love of the genre to his dad, Bob, an air steward known as ‘the nicest man in Qantas’ – so an appreciation of comedy isn’t the only trait he’s inherited. The obsession turned a corner on July 13, 1989, when, at the age of 18, Hills performed his first ever open mic stand-up set at the Sydney Comedy Store, packed with his uni mates who gave vocal support for his collection of smutty old jokes and song parodies. On his second gig, six months later, he died on his hole. But, although the experience smashed his confidence, it also made him determined to go back on stage and prove he could do it, a resilience so many comedians before him have experienced after an early blow. And indeed he did prove he could do it, becoming a regular open miccer at the club. Among the anecdotes he recalls from those times were witnessing a comic perform with a raging erection, a scumbag (sadly unnamed) star comic who belittled the teenage Hills backstage and creepily tried to seduce a young female stand-up, and the heckler who exposed himself to the acts. ‘if you’re getting the impression the Sydney comedy scene of the early Nineties was like the Wild West, you’re kinda right,’ he writes after some of these war stories. Though whether things have changed for newbies around the world remains moot. The young Hills was buoyed by a chance encounter with Connolly, whom he spotting in the street before the Scotsman’s gig at the Sydney Opera House. He received some encouraging words from his ‘hairy godmother’, which cemented his determination. In these pages, Hills passes on the advice he received in those early days of stand-up (and, later, in television too). The most useful comment to him came from an elder statement of the Aussie scene, Richard Carter, who told him not to talk about his missing foot until he’d mastered the comedy craft and could do so with meaning. Keeping shtum, would also it would stop Hills from forever be defined as the one-legged stand-up. His work in comedy gave Hills an entry into regular work, courtesy of the commercial radio business, initially submitting sketches for breakfast radio shows until finding himself hosting one himself. There are stories here of on-air pranks, both good and misjudged, and of interviewing some showbiz stars from Meatloaf to Barry Manilow. And in a real incident worthy of spoof hospital radio DJ Ivan Brackenbury, he recalls the time when an outside broadcast from a children’s ward followed a track from Billy Joel at his finest… Only The Good Die Young. So he did, quitting the radio job and cutting his teeth as a pro act on the Fringes of Adelaide and Edinburgh, including probably the most notorious night in Late N Live history when a druggie-era Russell Brand goaded an audience to physical hostility. Best Foot Forward has been 15 years in the writing, Hills suggests. Rather, it’s more accurate to say that he started collecting anecdotes and writing a diary in 2003. A couple of chapters comprising only these entries give a good snapshot of the strangeness of life on the road as a jobbing comedian, and proving that his career, like most comics’, has been a series of small breaks before what seems like overnight breakthroughs. At one point he was made to feel like the darling of Hollywood, with executives scrambling for his putative sitcom, but that came to nought. Hills’s long career is peppered with such celebrity encounters, from introducing Chris Rock on to the stage of the London Comedy Store, to meeting Kermit The Frog, the Dalai Llama, Whoopi Goldberg and The Queen, the latter two on the same night at the Royal Variety Performance (but he didn’t get to swap email addresses with Her Maj, only the member of comedy royalty there). Then there was the time Connolly rocked up at the Store, as if to see how the protégé he barely knew he had was getting on. And by then it was clear he had fallen on his feet. Or rather foot.